← CHAMPIONS CROWNED AT TRAILER ESTATES! by Ron Nurnberger!! 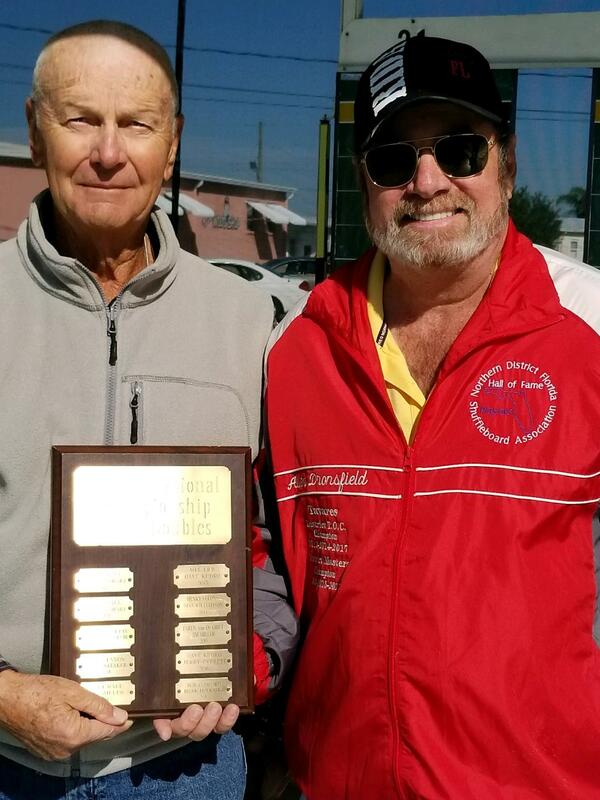 Back in December, Phil Rebholz and Dave Minnich played together at the tournament in Ft. Pierce and won 1st place. Earl Ball wrote that “old guys rule”. The story continues…. 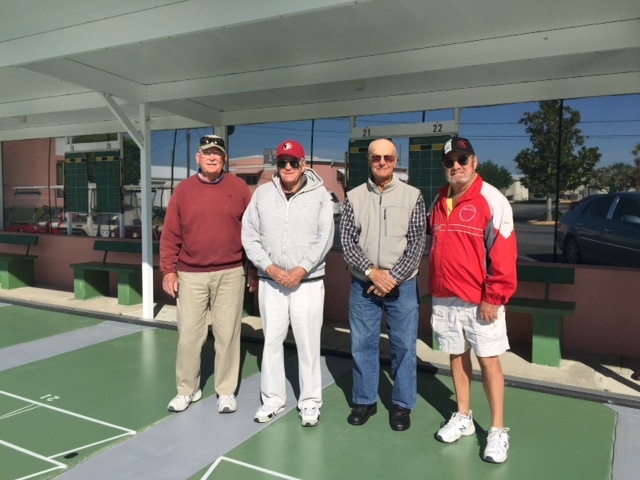 This week, the National doubles was held at Trailer Estates in Bradenton. There were 44 men’s teams and I believe, 25 women’s teams. Phil Rebholz was playing with Al Dronesfield and Dave Minnich was playing with Duane Cross. On Monday morning, Phil and Al met the tough team of Dave Kudro and Jerry Everett. They won and went on to face last year’s winners, Bob Comford and Hank Hoekstra. Another win after a 3 game contest. I saw Dave Minnich and he commented that it would be fun if he and Phil got to play in the finals. I thought “what are the odds of that happening’? As we were 150 miles from home, this meant staying overnight. Our Indiana friends, John and Dolores Brown had invited us to stay with them so we had an enjoyable evening of dinner out and a game of Bendominos. Tuesday morning arrived with rain which caused a short delay. Phil and Al won their next two matches and they were past the quarter finals. I was focused on Phil’s matches and had not been watching Dave, but he and Duane had also advanced past the quarter finals. In the afternoon, Phil and Al were matched against TOP player Jim Miller and his partner, Clarence Gingerich. Dave and Duane were matched against TOP players, Earl Ball and his partner, Henry Strong on the adjacent court. You can imagine that these matches drew an audience. The pressure was on Phil because Al is working toward his 200 Hall of Fame points!!! Wonder of wonders, Phil and Al won their match and Dave and Duane won theirs. This meant that Phil and Dave would be playing AGAINST each other for the coveted First Place on Wednesday morning! Wednesday dawned clear and Cold and everyone was bundled up. All four played their hearts out, but Phil and Al managed to win the match in two games. Dave commented that it was first place or nothing with Phil as this gave him his 4th first place win of this season! These two “old guys” , with GREAT partners, continue to make shuffleboard exciting and their wives proud. You have probably guessed that Al Dronesfield was a happy camper as he added 5 points toward his goal. Note: If this article is a little slanted, you can consider the author! My apologies to Dwayne Cross for misspelling his name.